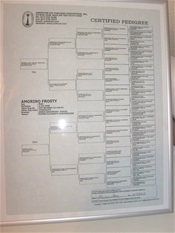 After months of waiting, Frosty's pedigree finally came in the post today. I was curious, not only for his ancestors, but to see if it would help me determind what Acey's true color could be, based on the colors of the cats in the pedigree. I know Nova's pedigree, Nebelungs for generations, and therefor the color Blue. In Frosty's pedigree I found a great-grandfather of Acey with the color lilac and a great,great,great-grandfather with the color cinnamon. Acey's grandfather was a chocolate tabby, grandmother solid chocolate. What recessive genes may have been hidden to emerge now ? Well, I am no wiser. Frosty's recessive genes in combination with Nova's color could give different results. So then there is science to decide the whole thing. A DNA-test will give me an answer so that I do not have to guess. I have found a company in Australia that can give me the correct answer online. I order the swabs and they test her DNA. That will tell me what her dominant and recessive genes are when it comes to her color. Or rather what to call her color. In bad light it looks grey, in good light she is brown. Lilac, cinnamon or something else ?